The self-concepts of behavioral disordered students and regular education students, grades 4th-6th were compared. The experimental group was enrolled in a regular class and the control group was enrolled in a special education class (n = 35). A three-point scale using art therapy techniques was the research method used to examine self-concept observed in the self-family and self pictures. The results indicated that the labeled group of behavioral disordered students internalized a more negative self-concept. Pictures drawn by the experimental group possessed darker colors, less variation in color combination, and more derogatory formations vs. the art created by the control group that projected brilliant colors, more color combination, and positively portrayed formations. Color choice (t = 2.92 ) (p < .006), affect 1 (t = 4.24) (p < .000), and affect 2 (t = 2.40) (p < .044) were found to have significant difference. The findings supported the self-fulfilling prophecy and the idea that being negatively labeled does become internalized and affects self-perception. Human interaction, socialization, and established relationships are vital to the very existence and functioning of our society. Every day people decide whether to accept or reject a person based on various characteristics and every day people experience being included or excluded. Theories developed by Erikson, Bronfennbrener, and Freud, suggested that establishing positive human interaction, socialization, and relationships during childhood and adolescence are essential to a healthy development. Therefore, it seems as though, if a child is constantly accepted, he/she will develop a positive sense of self; and if the child is constantly rejected, then he/she will develop a negative sense of self. Great concern should be expressed for children who are rejected by their peers because it is assumed that those individuals who fail early in life will continue to fail throughout their existence. In other words, if a person cannot establish positive relationships and successful interaction techniques as a child, then that person will discover, as an adult, the same difficulties and failures. Many times the rejection is facilitated by authoritative powers such as academic administrators and educators who ostracize the children by assigning special education labels and by segregating the labeled children into separate classrooms. The U.S. Department of Education (1993) reported that during the 1991-1992 school year, 37.2% of behavioral disordered children dropped out of school, 23% has a status of unknown, 8% obtained a certificate, and only 30% graduated with a diploma (Gregory, 1994). Gregory reported, “considering all students with disabilities, those with behavioral disorders are least likely to graduate from high school with a diploma, and are most likely to dropout” (p.16). Other studies supported this finding with a more specific example of externalizing disorder children that suggests children illustrating highly aggressive behavior are likely to portray a poor academic performance and drop out of school more frequently (DeRosier, Kupersmidt, & Patterson, 1993; & Ollendick, Wiest, Borden, & Greene, 1992). Behavioral disorders are defined by the Individuals with Disabilities Education Act (IDEA) (1997) as socially agreed upon labels of abnormal behavior that have persisted over a long period of time, and detrimentally affect educational development. In addition, behavioral disorders are considered: 1) inabilities that can not be explained by intellectual, sensory, or health factors that make learning difficult; 2) inabilities to establish and maintain successful relationships with peers and teachers; 3) inappropriate behaviors or feelings under normal situations; 4) generally consistent moods of sadness or depression, and/or; 5) the inclination to develop physical symptoms or fears of problems that are school or personally related. The negativity surrounding labeling, stereotyping, and stigmatizing has led to many states adopting new terminology when referring to behavioral disordered, such as emotionally disturbed, socially and emotionally maladjusted, and emotionally disturbed as a way to be less stigmatizing (Gregory, 1994). disruptions in eating and sleeping patterns, low energy level, lack of self-worth, difficulties in concentration and attention, lack of goal-directed behavior, feelings of hopelessness, social withdrawal, acting out behaviors and irritability . . . . excessive social withdrawal, avoidant behavior, and phobic behaviors. Somatic complaints, depression, obsessive or compulsive behaviors, and inability to form and maintain relationships . . . (Gregory, 1994, p. 13-14). Pervasive developmental disorders such as Autism, self-injurious behaviors, Asperger’s syndrome, childhood disintegrative disorder, and an early-onset of schizophrenia are also included in this category (Rosenberg, Wilson, Maheady, Sindelar, Misra, & Misra, 2004). Faussett (2003) reported that a 1995 study (Rubin, Coplan, Fox, & Calkins) shows that at-risk children for internalized disorders are those who are ostracized for some factor and in response to the exclusion chose to seclude themselves into solitude. Results of this solitude include loosing the chance of becoming socialized, learning socially accepted behavior, and being accepted and children who are at risk for externalized disorders are those who interact with others in a negative manner. Reports suggest that teachers in special education spend less time discussing academic topics with students and more time focusing on nonacademic topics (Bulgren & Carta, 1992). Most of the time, the focus in these classrooms is on the inabilities of the children. For example, if the child has a behavior problem, then the focus of the teacher will be on the child’s behavior (deviant behavior); if the child has a learning problem, then the focus of the teacher will be on the child’s difficulties in learning. However, teacher involvement and interaction with students show a link to student achievement; the more involved the teacher is with the student, the more achievement the student will obtain. According to Miller and Fritz (2000), students attending these classrooms report no coherent teaching plan is established or followed throughout the academic year, and the curriculum that is taught seems repetitious from year to year, without providing challenging new information for expansion. In addition, these classes tend to lower the goal of attainment; in other words, teachers expect less academic progress and accomplishment from students enrolled in a special education class (Ho, 2004). Despite the extensive research in support of exclusive special education classrooms in the mid 1900s, past research that examined the progress of students enrolled in a special education classroom, compared to those students remaining enrolled in a regular education classroom, showed no signs of higher achievement for one group or the other (e.g., Semmel, Gottlieb, Robinson, 1979; Rodee, 1971; & Budoff & Gottleib, 1976). While the majority of comparisons between mainstream education and special education suggest that mainstreaming and special education are equal in academic results (Budoff & Gottleib, 1976; & Gottleib, 1981), some studies do suggest that those students who are mainstreamed score higher on testing than those students segregated into a special education classroom (Rodee, 1971). Research consistently suggested that fully mainstreamed students in need of educational assistance would fail in the social arena of schooling because of their inability to interact in an acceptable manner (e.g., Johnson & Kirk 1950; Heber, 1956; & Baldwin, 1958). The basic assumption that, labeling leads to stigmatization, has been proposed and supported with findings by Becker (1963), Lemert (1967), Goffman (1986), and Riddick (2000). Goffman (1963), Fausett (2003), and Green (2003) suggest that stigma is a social process that separates people based on differences, usually of 1) physiological or biological manner such as race, age, gender, or physical appearance, or 2) social or behavioral status such as mental illness, ethnicity, perceived social class (Harper, 1999). Danda (2002), Susman (1994), Harper (1999), and Milich and McAninch (1992) further defined stigma as negative stereotypes of difference that can lead to prejudice or discrimination. Stigma and labeling can only affectively discriminate and oppress individuals when negative social reaction is a result of behavior. Stigma only affects self-concept when the individual has accepted and internalized social beliefs about normal behaviors, while simultaneously acknowledged that he/she is not perceived as normal and then concluding a lack of normalness and acceptance (Goffman, 1963). Faussett (2003) and Green (2003) explained stigma and labeling in terms of Link’s Modified Labeling Theory. The first step assumes that a general consensus of society exists that devalues and discriminates against certain labels and those who are stigmatized by those labels. The second step explains that in order for stigmatization to affectively exclude and oppress the individual, he/she must internalize the label. Step three is how the individual reacts to the status now that the negative attributes are attached to the individual’s self-concept, whether it be ignoring the label and hiding the disability, withdrawing from others who are suppressive, or interacting and educating others. Step four evaluates how lives are affected by the label and stigma imposed on people. Lowered self-esteem (Link, 1987) and negative social interactions are common results of being stigmatized with a negative label, which Fausett (2003) suggests will hinder future success for those individuals labeled. In the process of stigmatization, any information presented about a person that is not consistent with the applied label or stereotype is disregarded and completely ignored. Ho (2004) reported that being labeled as having a special educational need can influence people’s perceptions and expectations of students. Numerous studies report that children labeled as handicapped are less accepted than their ‘normal’ peers (Scranton & Rychman, 2001; Baldwin, 1958; Goodman, Gottlieb, & Harrison, 1972; Iano, Ayres, Heller, McGettigan, & Walker, 1974; & Johnson & Kirk, 1950). Social interaction reinforces internalization of negative self-concepts. The new self-beliefs result in deviant behavior, which in turn inhibits that individual from successfully interacting with others. Studies have consistently found that labels and their implied meanings affect how others interact and perceive students negatively labeled (Pelham & Bender, 1982; Milich, & McAninch, 1992; & Bromfield, Weisz, & Messer, 1986). The results of these studies revealed that the perceivers were more likely to become less involved and interested when their partners were label behavioral disordered. Milich and McAninch (1992) reported findings that revealed initial labels and descriptions of a child, regardless of truths or fallacies, will influence the expectations and feelings held by their peers and later interactions between peers and the child. Other studies have found that when peers are aware of the negative label they are more likely to exclude and reject the labeled child by being less friendly, talking less, and interacting less frequently (Milich & McAninch, 1992). Children as young as elementary age can identify deviant peers such as behavioral disordered children and will exclude those labeled students from the group and the more prevalent and visible the deviant behavior is recognized, then the more neglect and rejection the labeled student will experience (Novak, 1974). Children could successfully discriminate between children who acted normally and children who acted abnormal. This ability of children to be able to identify behaviorally/emotionally-disordered children and rate them less favorably suggests negative peer relations and a negative self-esteem for those children who are identified as abnormal. Social reaction to children being labeled behavioral disordered is exclusion; children who are labeled tend to be ostracized from “regular” groups of students, which Fausett (2003) states contributes to a lowered self-esteem. Numerous other studies (e.g., MacMillan, Jones, & Aloia, 1974; & Fernald & Gettys, 1980) find that self-concept, levels of aspiration, levels of expectations for achievement, and later adjustment in life decreases while peer rejection increases. Peer rejection has been established as having negative effects on children during childhood and predicting negative future outcomes (Sunwolf & Leets, 2004; & Harris, Milich, Corbitt, Hoover, & Brady, 1992). Studies have shown that students who are negatively labeled enjoy activities and interaction less when their peers are aware of the difference (e.g., Milich, & McAninch 1992; & Harris, Milich, Johnston, & Hoover, 1990). Children are reported to have problems with isolation, antisocial behavior, and lack of social growth or development (Sunwolf, & Leets, 2004). More specific behaviors of children who are excluded from their peers are aggressiveness, noncompliant, hyperactive, and being socially withdrawn (Wood, Cowan, & Baker, 2002). These studies have found that students specifically labeled behavioral disordered or emotionally disturbed experience peer rejection and exclusion from the group more often than students not labeled as such. Teachers’ perception does affect student behavior and success in the classroom. Many regular classroom teachers feel incompetent and unqualified to deal with children who are in need of special education. Furthermore, the research of Gickling and Theobald as cited in Parish, Dyck, and Kappes (1979) reported, “50% of the regular classroom teachers surveyed felt that mainstreaming actually was imposing upon them to help handicapped children” (p. 64). These opinions of teachers suggest that teachers believe that incorporating children who are underdeveloped or have deviated from the expected student role is considered a nuisance. Studies conducted like that carried out in Parish, et al. (1979), Parish and Copeland (1978), and Parish, Baker, Arheart, and Adamchak (1980) suggests that teachers respond with a more positive attitude to “gifted children,” “normal children,” and “physically handicapped children” than they do to those students labeled “mentally retarded,” “emotionally disturbed,” and “learning disabled.” Also, students labeled “emotionally disturbed” received the most negative evaluations and ratings from the teachers surveyed. Most of these labels focus on the failures and inabilities of a student and completely ignores strengths of the child, which possibly results in the label becoming the only identity of the child and the whole identity of the student becoming lost. The self-fulfilling prophecy, as defined by Darley and Fazio (1980), is the relationship between a person’s preexisting belief and expectation about another person that leads the other person to confirm the belief through behavior. The person who holds the belief or expectation will interact with the other person in a manner to suggest and facilitate the predicted response, which is then acted out and confirmed by that person in a manner that fulfills the prophecy. Harris, Milich, Corbitt, Hoover, & Brady (1992) summarized the model of the expectancy process established by Darley and Fazio as “expectations held by perceivers cause them to behave differently toward targets in accordance with the expectancy; the targets, on experiencing this treatment, respond in a manner that confirms the initial expectancy and thus reinforces the perceivers’ expectations” (2). Rosenthal, the leader of expectancy effects studies, reported in several studies that the expectation of authority figures do influence responses and behaviors of others such as experimenter to participant and teacher to student. Milich and McAninch (1992) reported that one controversial study found that students’ IQs significantly increased in one school year when their teachers were led to expect high academic gains (Rosenthal & Jacobson, 1968). Meeting the expectations of others appears to be a possible result of the socialization process in the manner of labeling, stigmatization, stereotyping, and peer rejection/exclusion. Gregory (1994) states self-concepts are self-beliefs or descriptions of one’s behaviors or attitudes that can be simultaneously positive or negative self-perceptions of their personality, capabilities, and behavior. Gregory (1994) reported that Carl Rogers established the self-concept theory defining self-concept as “a result of an individual’s interaction with his/her environment . . . . incorporating values of others . . . . striving for consistency . . . . a result of maturation and learning” (p. 41). According to this definition, self-concept is interchangeable with self-regard and self-esteem. In essence, if an individual possess a high self-esteem or positive self-regard then that individual is said to have a positive self-concept; in contrast, if an individual has low self-esteem then the individual is said to have a negative self-concept. A positive self-concept is viewed as 1) being active and assertive in meeting demands and expectations of others; 2) demonstrating confidence in abilities to succeed and deal with events; 3) participating in independent exploration; 4) possessing self-respect, pride, self-acceptance, and self-love; 5) accepted by peers; 6) and possessing a low level of anxiety (Coopersmith, 1967). On the other hand, a negative self-concept is defined as 1) having high level of anxiety; 2) possessing feelings of inferiority; 3) having difficulty in forming meaning relationships; 4) eagerly conforming to social pressures and expectations; 5) responding severely to criticism; 6) possessing pessimistic views of abilities and past, present, and future behaviors (Coopersmith, 1967). According to Gregory (1994), other researchers have established supported data that variables such as attitudes and self-concept can influence behavior. There is evidence to suggest that the special class placement stigmatizes children who are labeled behavioral disordered and they simultaneously internalize a lower self-concept (Jones, 1972). In addition, these findings also suggest that the label implies deficiencies and shortcomings of those identified. Colangelo, Kelly, and Schrepfer (1987), report a positive correlation between academic success and self-concept; as academic success increases so does self-concept, and as academic success decreases, so does self-concept. The researchers found that of the gifted children, average students, and special learning needs students that participated in the study, special learning need students achieved the least academic success and appeared to possess a lowest self-concept of all groups. In essence, those students who have the greatest academic difficulties such as special education students also have the greatest need for aid in improving their self-concept. According to Gregory (1994), research has been conducted that suggests self-concepts of behaviorally disordered children are significantly lower than non-disabled peers. Furthermore, scores from standardized measurement instruments for self-concept, academic self-concept, and behavioral self-concept of behavioral disordered children are lower than their non-labeled peers. Other studies report that partially mainstreamed and partially segregated BD students have a significantly higher self-concept than those BD students who were totally segregated into a special education classroom (Gottlieb, 1981). Bandura’s Social Learning Theory purports that environmental factors, internal characteristics, and behavior do possess an intertwining relationship. It could be suggested, then, that environmental factors such as other people labeling students behavioral/emotional disordered are internalized into a negative self-concept and the students then act out negative behaviors. The first step is to examine whether or not behavioral disorder children have indeed internalized their label and incorporated the stigmatized and expected thoughts and behaviors into their sense of being. The research examined the self-concepts of behavioral disordered children. Self-concept was defined by color choice, family inclusion/exclusion, proximity of family, family figure size, self size, and overall affect or mood of the pictures drawn. This study hypothesized that a behavior disorder labeled students would appear to depict a negative self-concept more so than regular education students. This study also hypothesized that those students enrolled in a regular curriculum class would appear to illustrate a more positive self-concept than the behavior disordered children. Participants in this study consisted of 35 middle school students enrolled in two Midwest public schools. The regular education student population came from a largely populated and much diversified school located on a military base. The behavioral disordered/special education student population came from a different academic setting located in a rural area with a small student population. 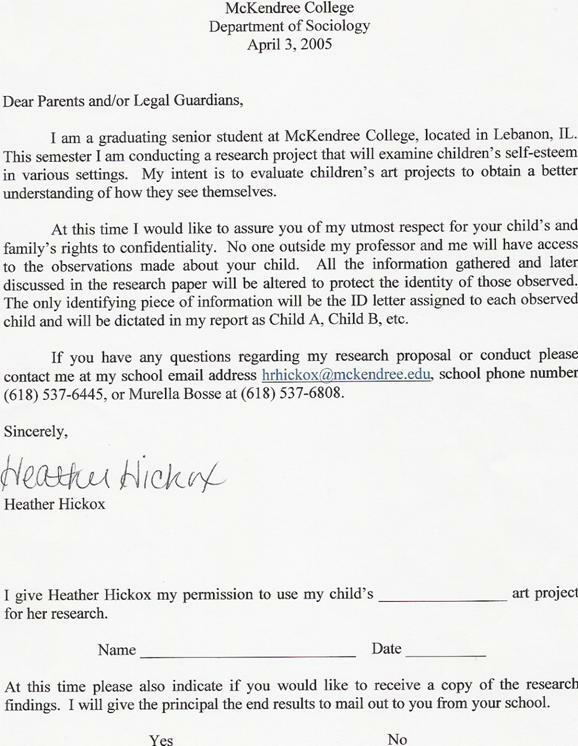 A signed consent form from the school and legal guardian was required for participation (See Appendix A). The student population consisted of 4th, 5th, and 6th grade females and males ranging from ages 9 to 13. African Americans, European Americans, Hispanics, and multiracial were the only four ethnic categories represented by the sample population. Supplies needed for this project were 2 sheets of 8”x 11” white paper and a box of 16 crayola crayons for each child. The supplies were provided by the researcher in an attempt to establish consistency in color usage and space available in which to draw. The colors included: black, brown, blue, blue green, green, yellow green, blue violet, purple, red violet, red, pink, red orange, orange, yellow orange, yellow, and white. A ration chart was developed to evaluate results by using a three point scale based on six factors 1) color choice, 2) inclusion or exclusion of family members, 3) proximity to parental figures and other family members, 4) size of family members, 5) size of self figure, and 6) negative or positive affect. Color was measured by 1 = majority of dark colors used (black, brown, blue), 2 = a mixture of bright and dark colors used, and 3 = majority of bright colors used (red, orange, yellow). Total exclusion of family members was represented by 1, while inclusion of some family members was illustrated by 2, and total inclusion of family members was portrayed by 3. A great distance between the person and other family members was considered a 1, some closeness was measured as a 2, and close proximity to other family members was a defined as a 3. Size of family members was measured with a 1 = very small size, 2 = average size, and 3 = large size. Similarly, size of self-figure was measured with 1 = very small size, 2 = average size, and 3 = large size. Affect was defined as 1 = very negative affect, 2 = mixture of negative and positive affect, and 3 = very positive affect. Evaluations of the family drawing encompassed all six factors. However, results of the self picture were evaluated based on only three of the factors 1) color choice, 2) size of self figure, and 3) negative or positive affect. Each factor was rated on a three point scale. Each school was contacted by phone and informed of the intent of the researcher to analyze artwork of the students. Classroom teachers were requested to instruct, based on the directions left by the researcher, the students to create two drawings one of self and one of the individual’s immediate family and self. Consent forms were obtained from the school administration and also from each student. Each student who agreed to participate created two pictures. The first creation was a depiction of the individual’s nuclear family and self, and the second picture was to represent the individual self. On the scheduled day of the project each teacher gave the students the following directions: “Use the white multi-use paper and a set of crayons set before you to create two pictures. The first picture is supposed to be a depiction of your immediate family or other individuals you feel close to. The second drawing is supposed to illustrate how you feel and think about yourself. After each picture is finished, please title the drawing on the top of the paper.” Then the teacher wrote the demographics of each student: gender, ethnicity, age, grade level, type of class whether special education or regular education, and when it applied year placed in special education and the BD label imposed on the student. After all the drawings were completed and the information was filled out, the drawings were placed in a manila envelope and stored in the principal’s office until they were picked up later that same day by the researcher. The results were anonymous and the researcher evaluated the drawings using a double-blind research approach. The sample student population consisted of 15 females and 20 males with an average age of 10. Participants consisted of 5.7% (2) nine year olds, 34.3% (12) ten year olds, 42.9% (15) eleven year olds, and 17.1% (6) twelve year olds. African Americans made up 17.1% (6) of the sample while 68.6% (24) European Americans, 2.9% (1) Hispanics, and 11.4% (4) multiracial composed the rest of the population. In addition, the sample was constructed of 8 (22.9%) 4th graders, 25 (71.4%) 5th graders, and 2 (5.7%) 6th graders. Out of the entire sample population of 35 students, 27 were enrolled in only a regular class curriculum, and 8 were enrolled in only a special education class curriculum and labeled BD. All 35 participants completed the drawing of self, however, only 33 participants also completed the drawing of self and family; two of the behavioral disordered students did not complete the self-family drawing. A series of independent t-test were conducted using group membership (BD labeled or non-BD labeled/regular education) as the independent variable. The dependent variables used in the tests included for the self-family pictures: color choice, exclusion/inclusion, closeness of family members, family size, self size, affect, and for the self drawings: color choice, self size, and affect. Results of these analyses can be observed in Table 1 and Table 2. Only three dependent variables appeared to hold any significant findings. Color choices for self-family pictures showed a significance of p < .006 and t = 2.92. Affect depicted in self-family drawings also held a significance of p < .000 and t = 4.24. In the self pictures, only affect was found to hold significant difference p < .044 and t = 2.40. Color choice for the self-family picture drawn by regular education students illustrated more bright colors (see Appendix B), a mean of 2.074, where as, behavioral disordered students used more darker colors in their pictures (see Appendix C), a mean of 1.167. Affect for the self-family drawing was similarly distributed. Regular education students had a mean affect of 2.667 (see Appendix D) and behavioral disordered students possessed a mean affect of 1.50 (see Appendix E). The only significance found in the self pictures was affect; regular education students depicted affect with a mean of 2.74 (see Appendix F) and behavioral disordered students illustrated affect with a mean of 1.87 (see Appendix G). Further analysis of the results show a higher self-concept in the self pictures than the self-family pictures. Only three variables were used to make this comparison: color choice, size of self, and affect. In the case of the self pictures, color choice had a mean of 2.057, size of self had a mean of 2.37, and affect had a mean of 2.54, which represented usage of brighter colors, slightly larger than average size of depiction of self, and a more positive mood. Self-family drawings, on the other hand, show a color choice mean of 1.91, a self size mean of 1.97, and an affect mean of 2.45, which represents usage of darker colors, smaller depiction of self size, and a more negative mood. Even though no significant difference was established by the results, the means of the variables do suggest a difference between regular education students and behavioral disordered students. Regular education students included family members slightly more (mean = 2.889) than behavioral disordered students (mean = 2.667). In addition, a closer proximity of family members was observed in the regular education students’ drawings, a mean of 2.74. Consequently, the behavioral disordered students’ drawings showed a little more distance between family members and a mean closeness of 2.33. Contrary to the more positive finding in the self-family drawings of regular education students, the mean for family size was found to 1.96 in the regular education students’ pictures and 2.167 in the behavioral disordered students’ drawings. A color choice mean of 2.148 and a self size mean of 2.444 were found in the self pictures of regular education students, a more positive depiction. On the other hand, the self pictures drawn by behavioral disordered children had a color choice mean of 1.75 and a self size mean of 2.125, a depiction of a more negative self concept. Because of time constraints, this study did not receive the proper amount of time to obtain a large and inclusive sample population. Only 27 participants were included in the regular education sample and 8 participants in the behavioral disordered sample. These numbers are not large enough to establish significant difference between the two membership groups (regular education and behavioral disordered). Also, the difference in numbers does not allow for a fair comparison between groups. Another limitation included incomplete gathered data. Not all the participants were able to complete both drawings. However, the drawings that were completed were included in the study. Only two people did not finish their family drawing, but their self drawing was included in the analyses. Suggestions for future research includes a larger and more inclusive sample population and a longer time frame within to complete and obtain enough data to establish credibility, significance, and generalizability. However, this study finds partial support for both hypothesis that 1) behavior disorder labeled students will appear to depict a negative self-concept more so than regular education students and 2) those students enrolled in a regular curriculum class will appear to illustrate a more positive self-concept than the behavior disordered children. Behavioral disordered students were found to illustrate self-family and self pictures possessing more negative attributes. On the other hand, regular education students were found to illustrate self-family and self pictures possessing more positive attributes, except for exclusion/inclusion, which was recorded as more negative than the behavioral disordered students’ drawings. Only three variables established significant difference: color choice and affect in the self-family pictures and affect in the self pictures. However, all other variables except exclusion/inclusion were found to go in the direction of the hypotheses. 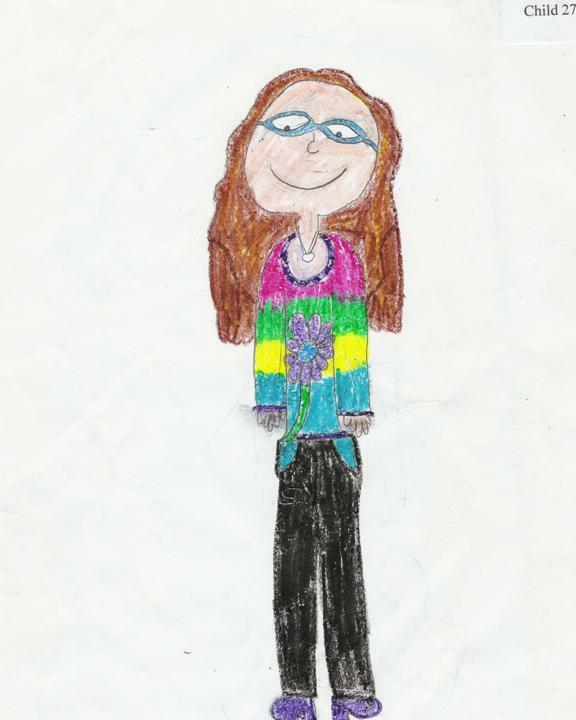 Overall, the behavioral disordered students’ drawings illustrated a negative demeanor and self-concept. In these pictures, darker colors such as blacks, browns, and blues were the majority choice of color. Six of the fourteen pictures were completed in only black, brown, and/or blue, or gray pencil. The color choice suggest a sadness or unhappiness about the pictures and since the pictures are depicting self and family it seems as though the pictures are representing an unhappiness with self, which implies a negative self-concept. In addition, family size and self size observed in the drawings of behavioral disordered students were of a small scale compared to the paper space provided. Some family figures did not even take up half of the page and other families were not even given bodies; just their heads were drawn. The size of the family members appears to be the perception of how the participant viewed his/own family, which seems to be negative. Furthermore, the size of self also seems to suggest that the individual’s perception of self is low, which implies a negative self-concept. 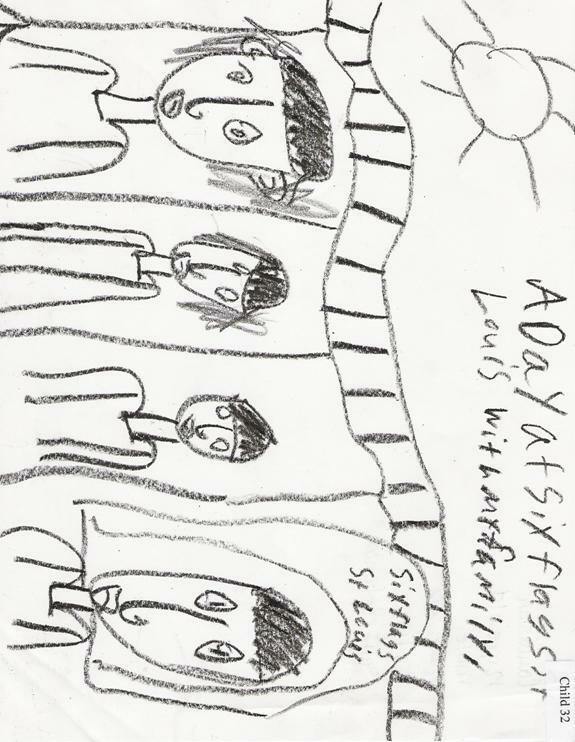 Also, behavioral disordered students’ drawings illustrated a distant proximity of family members. 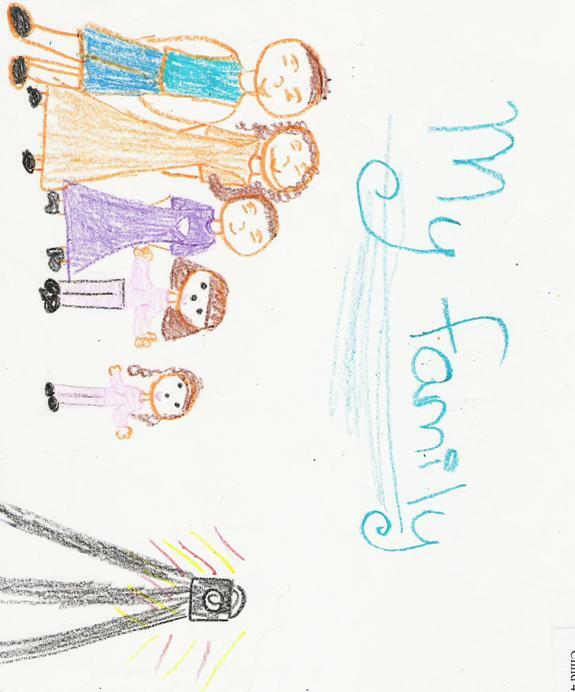 Only two families were depicted holding hands, while the majority of the other self-family pictures portrayed the families being separated either by concrete objects or not being able to touch do to the lack of bodies being present. The distant portrayal of family closeness seems to suggest a lack of family connectedness or support. Moreover, the general affect or mood of the behavioral disordered students’ pictures was of a negative disposition. Most of the faces illustrated blank stares and lack of emotion. Other drawings represented devious or mischievous demeanors through facial expressions and portrayal of body parts. The dark colors used added to the negative and depressive nature of the drawings. 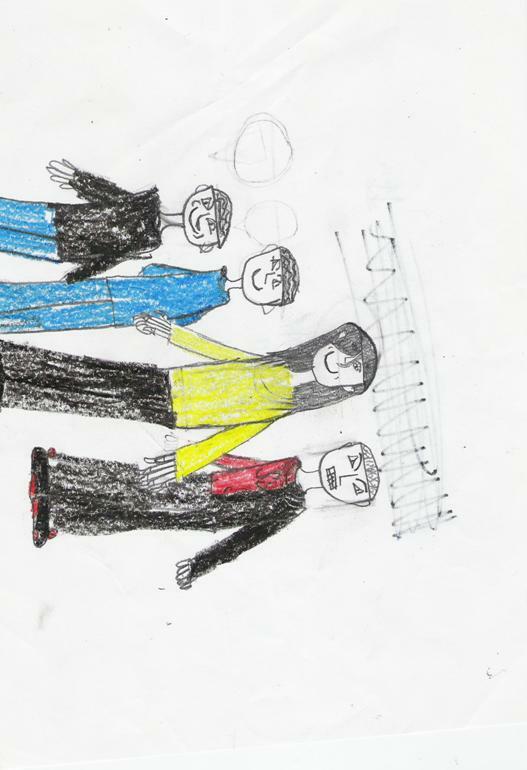 On the other hand, drawings of regular education students represented a more positive atmosphere and self-concept. Brighter colors like whites, pinks, reds, oranges, and yellows were the most common color choices in these drawings. A combined usage of dark and bright colors was found in regular education students’ drawings. The choice of color usage seems to suggest that the perception held by the participants is a sense of positive feelings such as happiness and contentment. 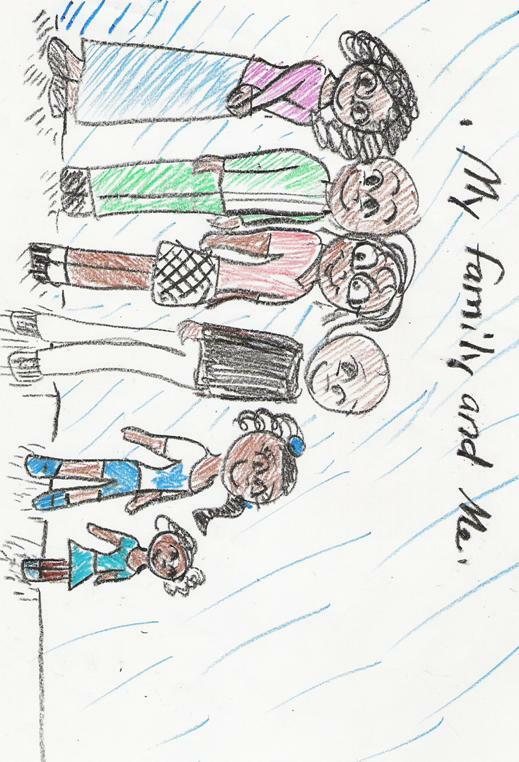 In addition, the proximity of family members drawn by regular education students appeared much closer and personal in these drawings, yet total family inclusion declined. It was difficult to decipher which members were included or excluded from the drawings. However, the regular education students drew more numbers of family members than behavioral disorder children. Almost all the self-family pictures illustrated family members standing very closely; some drawings depicted family members standing so close together that the figures drawn were almost touching. The closeness of family members appears to be a depiction of the closeness and sense of support felt by the participants with their families. The exclusion of or lesser number of family members may simply mean that the participants have very few immediate family members or they could simply not feel close to all the members of their families. Also, family size and self size in the drawings of regular education students appeared larger and covered more space on the paper. This portrayal of taking up large amount of space seems to suggest that the participants’ perceptions of family and self are very positive. This positive perception may be an indicator of positive self-concept. Moreover, regular education students’ pictures possessed a positive affect or mood. For example, smiles drawn on the faces were large and noticeable. Furthermore, the activities depicted in the pictures appeared enjoyable and gratifying. The positive depiction that was portrayed throughout the regular education students’ drawings seem to entail a positive perception and attitude about the people and situations illustrated, which could suggest a positive self-concept. Despite the limitation of generalizability, this study did support previous findings that self-concept for behavioral disordered children is lower than the self-concept of non-labeled children. The findings of this study propose that by incorporating negative aspects into their drawings, behavioral disordered students appear to possess a negative self-concept, where as, regular education students who have used more positive aspects in their drawings possess a positive self-concept. Baldwin, W. K. (1958). The social position of the educably mentally retarded child in the regular grades. Exceptional Children, 25, 106-108; 112. Becker, H. S. (1963). Outsiders: studies in the sociology of deviance. New York, Free Press. Bromfield, R., Weisz, J. R., & Messer, T. (1986). Children’s judgments and attributions in response to the ‘mentally retarded’ label: A developmental approach. Journal of Abnormal Psychology, 95, 81-87. Budoff, M., & Gottleib, J. (1976). Special class EMR children mainstreamed: A study of an aptitude (learning potential) X treatment interaction. American Journal of Mental Deficiency, 81, 1-11. Bulgren, J. A., & Carta, J. J. (1993). Examining the instructional contexts of students with learning disabilities. Exceptional Children, 59, 182-191. Colangelo, N., Kelly, K. R., & Schrepfer, R. M. (1987). A comparison of gifted, general, and special learning needs students on academic and social self-concept. Journal of Counseling and Development, 66, 73-77. Coopersmith, S. (1967). The antecedents of self-esteem. San Francisco: W.H. Freeman. Danda, C. E. (2002). Adolescence, emotional and behavioral problems, and counseling: Where’s the stigma? Doctoral dissertation, University of Florida. Darley, J., & Fazio, R. (1980). Expectancy confirmation processes arising in the social interaction sequence. American Psychologist, 35, 867-881. DeRosier, M., Kupersmidt, J.B., & Patterson, C.J. (1993). Children’s academic and behavioral adjustment as a function of the chronicity and proximity of peer rejection. Child Development, 65, 1799-1913. Fausett, Y.M. (2003). Elementary school children’s stigmatization of children with mental illness. Doctoral dissertation, University of Rhode Island. Fernald, C. D., & Gettys, L. (1980). Diagnostic labels and perceptions of children’s behavior. Journal of Clinical Child Psychology, 229-233. Gickling, E., & Theobald, J. (1975). Mainstreaming: Affect or effect. Journal of Special Education, 3, 317-328. Goffman, E. (1963). Stigma: Notes on the Management of Spoiled Identity (p.3). Englewood Cliffs, NJ: Prentice-Hall, Inc.
Goffman, E. (1968). Stigma: notes on the management of spoiled identity. Harmondsworth, Pelican Books. Goodman, H., Gottlieb, J., & Harrison, R. H. (1972). Social acceptance of EMRs integrated into a nongraded elementary school. American Journal of Mental Deficiency, 76, 412-417. Gottlieb, J. (1981). Mainstreaming: Fulfilling the promise? American Journal of Mental Deficiency, 86(2), 115-126. Green, S. E. (2003). What do you mean ‘what’s wrong with her? : Stigma and the lives of families of children with disabilities. Social Sciences & Medicine, 57(8), 1361-1375. Gregory, K.M. (1994). Generalization and maintenance of treatment gains using self-evaluation procedures with behaviorally disordered adolescents. Master’s thesis, The University of Connecticut. Harris, M. J., Milich,R., Corbitt, E. M., Hoover, D. W., & Brady, M. (1992). Self-fulfilling effects of stigmatizing information on children’s social interactions. Journal of Personality and Social Psychology, 63(1), 41-50. Harris, M, J., Milich, R., Johnston, E. M., & Hoover, D. W. (1990). Effects of expectancies on children’s social interactions. Journal of Experimental Social Psychology, 26, 1-12. Harper, D. C. (1999). Social psychology of difference: Stigma, spread, and stereotypes in childhood. Rehabilitation Psychology, 44(2), 131-144. Heber, R. J. (1956). The relation of intelligence and physical maturity to social status of children. Journal of Educational Psychology, 47, 158-162. Ho, A. (2004). To be labelled, or not to be labelled: that is the question. British Journal of Learning Disabilities, 32, 86-92. Iano, R., Ayres, D., Heller, H., McGettigan, J., & Walker, V. (1974). Sociometric status of retarded children in an integrative program. Exceptional Children, 40, 267-271. Individuals with Disabilities Education Act. (1999, October). Public Law 101-476. 104 STAT. 1103-1151. Johnson G. O., & Kirk, S. A. (1950). Are mentally handicapped children segregated in the regular grades? Exceptional Children, 17, 65-68,87-88. Jones, R. L. (1972). Labels and stigma in special education. Exceptional Children. 38(7), 553-654. Lemert, E. M. (1967). Human deviance, social problems, and social control. Englewood Cliffs, NJ, Prentice Hall. Link, B.G. (1987). Understanding labeling effects in the area of mental disorders: An assessment of the effects of expectations of rejection. American Sociologic Review , 52, 96-112. MacMillan, D. L., Jones, R. L., & Aloia, G. F. (1974). The mentally retarded label: A theoretical analysis and review of research. American Journal of Mental Deficiency, 79, 241-261. Milich, R., & McAninch, C. B. (1992). Effects of stigmatizing information on children’s peer relations: Believing is seeing. School Psychology Review, 21(3), 400-410. Miller, M., & Fritz, M. F. (2000). What do special education students think of school placement? 1-29. Novak, D. (1974). Children’s reactions to emotional disturbance in imaginary peers. Journal of Consulting and Clinical Psychology, 42, 462. Ollendick, T.H., Weist, M.D., Borden, M.C., & Greene, R.W. (1992). Sociometirc status and academic, behavioral and psychologic adjustment: A five-year longitudinal study. Journal of Consulting and Clinical Psychology, 60, 80-87. Parish, T. S., & Copeland, T. (1978). Teachers’ and students’ attitudes in mainstreamed classrooms. Psychology Rep., 43, 54. Parish, T. S., Dyck, N., & Kappes, B. (1979). Stereotypes concerning normal and handicapped children. Journal of Psychology, 102, 63-70. Parish, T. S., Baker, S. K., Arheart, K. L., & Adamchak, P. G. (1980). Normal and exceptional children’s attitudes towards themselves and one another. The Journal of Psychology, 104, 249-253. Pelham, W. E., & Bender, M. E. (1982). Peer relationships in hyperactive children: Description and treatment. In K. D. Gadow & I. Bialer (Eds. ), Advances in Learning and Behavioral Disabilities, 1, 365-436. Greenwich, CT:JAI Press. Riddick, B. (2000). An examination of the relationship between labeling and stigmatization with special reference to dyslexia. Disability & Society, 15(4), 653-667. Rodee, M. (1971). A study to evaluate the resource teacher concept when used with high level educable retardates at a primary level. Unpublished doctoral dissertation, University of Iowa. Rosenthal, R., & Jacobson, L. (1968). Pygmalion in the classroom. New York: Hotl, Rinehart, & Winston. Rubin, K.H., Coplan, R.J., Fox, N.A., & Calkins, S. (1995). Emotionality, emotion regulation, and preschoolers’ social adaptation. Development and Psychopathology, 7, 49-62. Cited in Fausett, Y.M. (2003). Elementary school children’s stigmatization of children with mental illness. Dissertation, University of Rhode Island. Scranton, T. R., & Rychman, D. B. (2001). Sociometric status of learning disabled children in an integrative program. Journal of Learning Disabilities, 12(6), 49-54. Semmel, M. I., Gottlieb, J., & Robinson, N. M. (1979). Mainstreaming: Perspectives on educating handicapped children in the public schools. In D. Berliner (Ed. ), Review of Research in Education, 7, Washington DC: American Educational Research Association. Sunwolf & Leets, L. (2004). Being left out: Rejecting outsiders and communicating groups boundaries in childhood and adolescent peer groups. Journal of Applied Communication Research, 32(3), 195-223. Susman, J. (1994). Disability, stigma and deviance. Social Science and Medicine, 38,15-22. Wood, J. J., Cowan, P. A., & Baker, B. I. (2002). Behavior problems and peer rejection in preschool boys and girls. Journal of Genetic Psychology, 163, 72-89. In Sunwolf & Leets, L. (2004). Being left out: Rejecting outsiders and communicating groups boundaries in childhood and adolescent peer groups. Journal of Applied Communication Research, 32(3), 195-223.